The spirituality of India comes alive in the mountains of West Virginia. After the visit to the Palace of Gold, the tour continued just down the road in their New Vrindaban Temple. Arrival happened just in time for one of their worship services, which are held seven times a day every day of the week. Before entering, shoes must be removed or covered, to pay respect to the deity within the Temple. 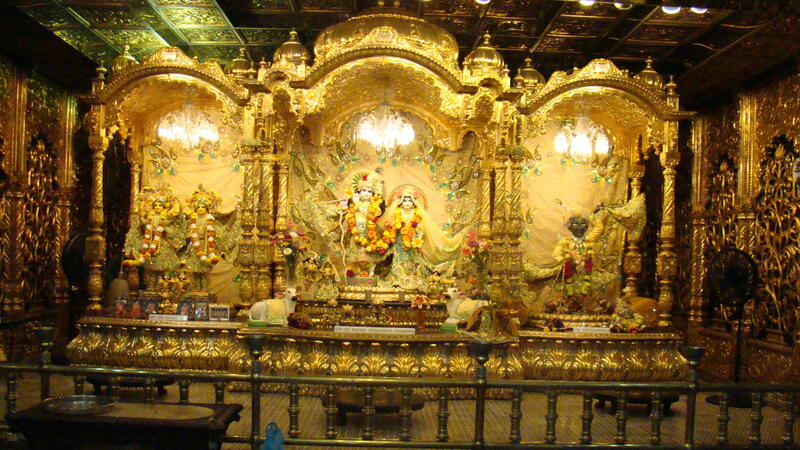 The inside of the Temple is where the statues of Krishna can be found in a golden setting. 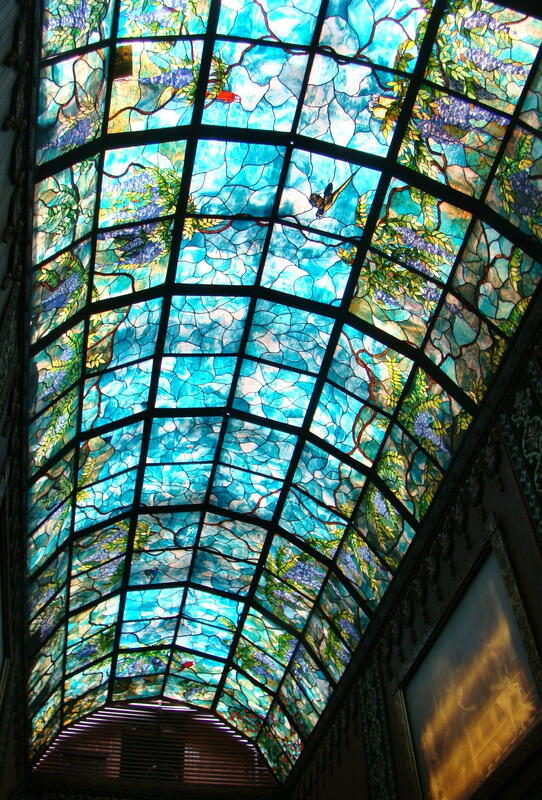 The statues are shimmering while the stained glass ceiling allows filtered light to fill the room. People from all over the world come here to worship their Hindu beliefs. Ladies were dressed in their finest saris to honor Krishna. Their fine dress also showed their affluence and success to everyone present. This is a congregational worship service with all those in attendance chanting a prayer to their God. They also use prayer beads, a string of 108 – a special number for their faith. To say a full prayer, you must go around the string sixteen times, which usually takes about an hour. Basically, the prayer that is repeated says: Hare Krishna, please allow me to serve you. 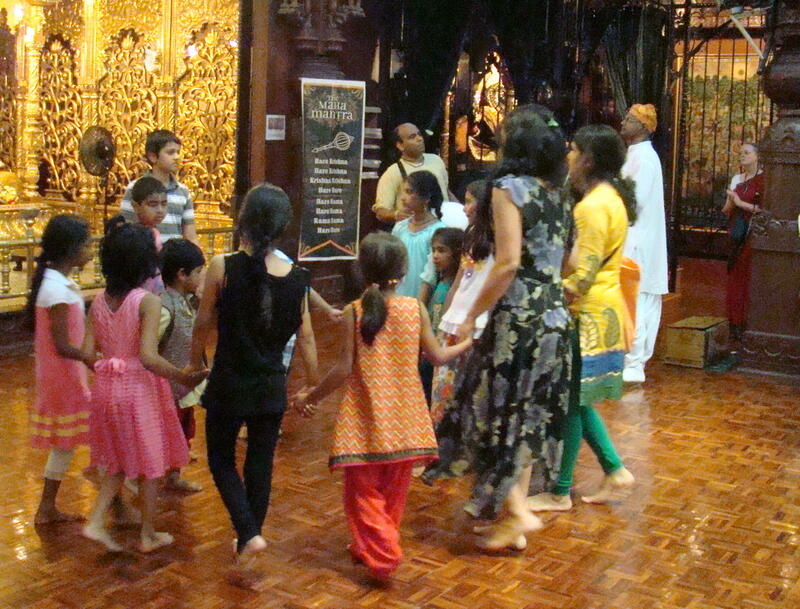 Children chant and dance before the altar. But mainly going to the Temple becomes a place to receive Darshan – you are looking at Diety and they are looking at you for a transfer of grace and spirituality. A priest made and accepted offerings at the altar through fire, incense, and water. An offering tray filled in the center with their holy burning butter was carried through the Temple. Those who desired could receive a blessing connection from its fragrant smoke. After the service, a vegetarian lunch was served in the courtyard of the Temple. Dishes included: Basmati rice; Chickpeas sauteed with spices; Subji -sauteed mixed vegetables; and Halavah – a sweet dessert made with farina toasted slowly in butter. Our table was honored to be joined for lunch by Andy Fraenkel, the wonderful storyteller, and even Jaya Krishna Das, the president of New Vrindaban Temple. 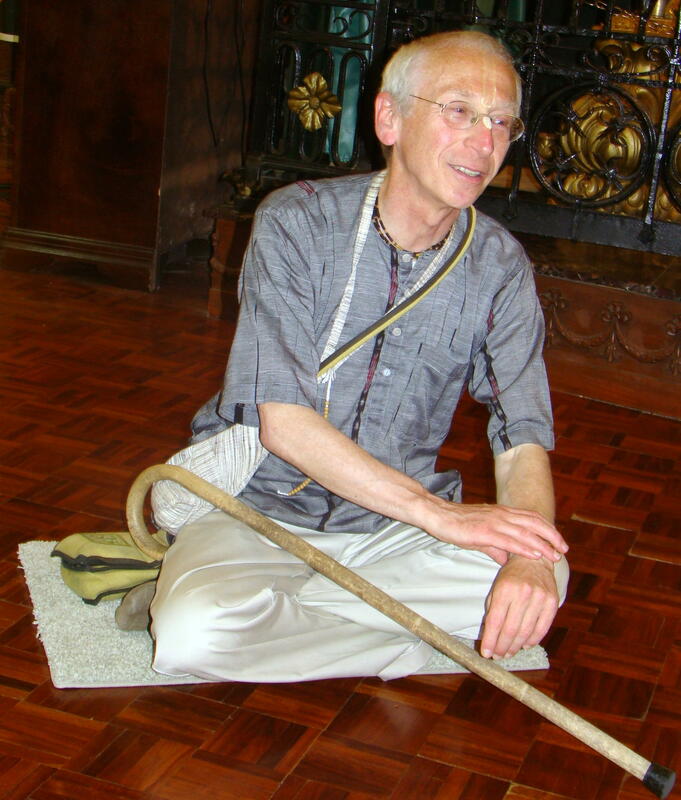 Back inside the Temple, listeners sat on the floor with Andy as he told stories of Krishna. One, in shortened version, began with Krishna’s birth in a dungeon of a wicked king. They were imprisoned because the king wanted to be certain to kill the new baby boy, as he was the eighth son born on the eighth night of the month, and was prophesized to be the king’s slayer. But, he escaped with his father after everyone fell into a deep sleep and the dungeon door opened. Krishna and his father were protected on their journey by a Divine snake. His father carried Krishna in a basket through the waters of a river that parted to ensure their safe passage. There they traded Krishna for a female child and his father took the female baby back to the dungeon before the king discovered the birth. Eventually as years passed, Krisha came back to the city and killed the wicked king. Many stories were told that day but you will have to visit yourself to hear more! Many of the stories describe the many forms that Krishna took during his lifetime. Some of those include: Butter Boy, Blue Boy, amd Lion Man. Surrounding the Temple is the New Vrindaban community. Only a small portion of the believers now live on the grounds, but there is a group of apartments where devotees can stay. The basic teaching of the Krishna Consciousness is that we are all individuals and have a loving relationship with God. Where once only woods stood, now visitors can stay in a beautiful lodge built in 1981-82, or cottages along Swan Lake. Many families spend their vacations here to worship in a Hindu atmosphere. 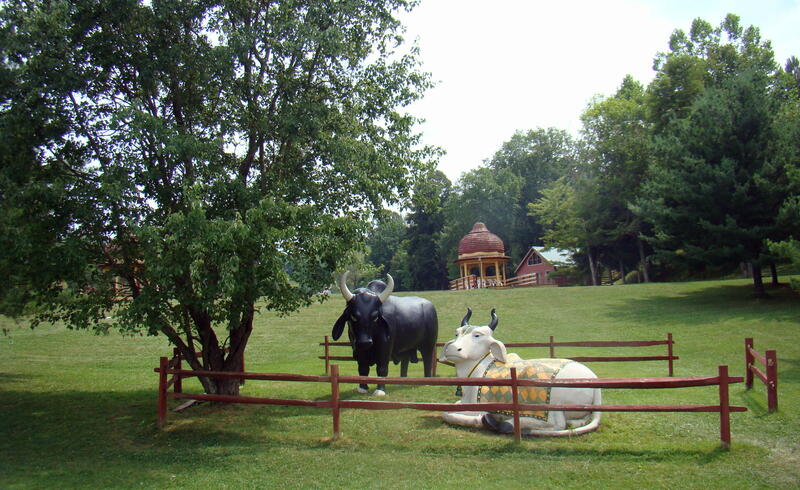 Around the lake are several gigantic statues honoring their faith: Sacred Cows, Elephant, and a pair of 30-foot-tall Sri Sri Gaura Nitai statues. New Vrindaban is located just down the road from the Palace of Gold. From Moundsville, WV take Route 250 South. Watch for signs along the road for easy directions.